In the summer of 2018 we were asked to produce a pieces of artwork at Freedom Festival in both Zebedees Yard, and as part of the Artlink Feastival site in Queens Gardens. Working with artist @Faace, we created two huge murals live at the festival, and he created this wonderful video to showcase our work. The mural we created for Artlink was designed around the theme of sharing, and depicted @faace trademark long-limbed characters collecting, and sharing vegetables. We also created an art work work, for any budding young creatives to make their mark by adding faces to the many fruit and vegetables we had drawn. A few super creative youngsters also helped us add faces to some real vegetables too! 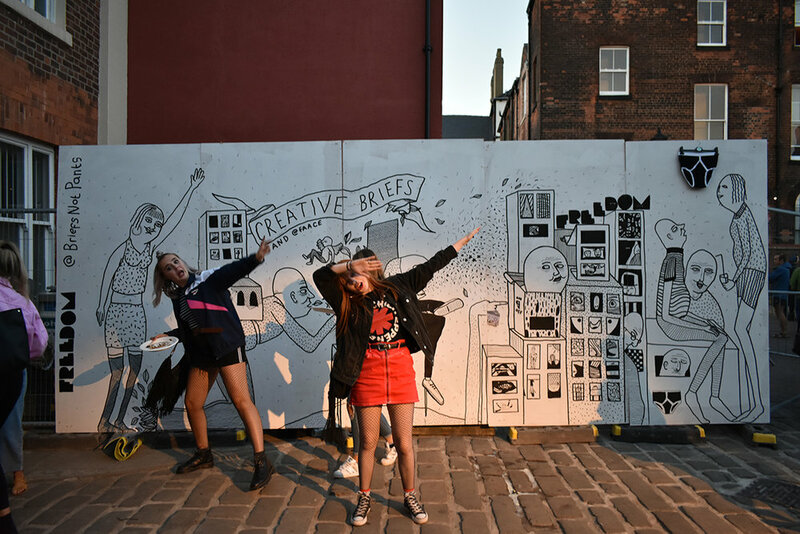 In Zebedees Yard we created this impressive mural, which greeted festival goers as they entered the venue. It wasn’t long before the mural became a bit of an Instagram sensation! Did you take a selfie with our murals? We’d love to see them! Tag us in your comments on Instagram @briefsnotpants so we can check them out.